Will he..... or won't he? 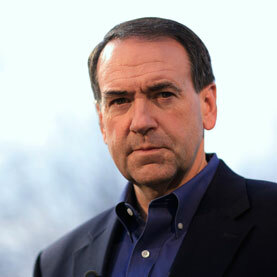 Tonight, former Arkansas Governor, 2008 presidential candidate, and Fox News host Mike Huckabee will announce his decision regarding running for President in 2012 - or not. The announcement is set to take place at the end of his TV show, on the Fox News Channel. His show starts at 7pm CST. I hope not. He carried the 2nd District in '08 but everyone I asked why the voted for him said because he supported FairTax "Because he is our neighbor." I expect more from our president and I did not see it in him.